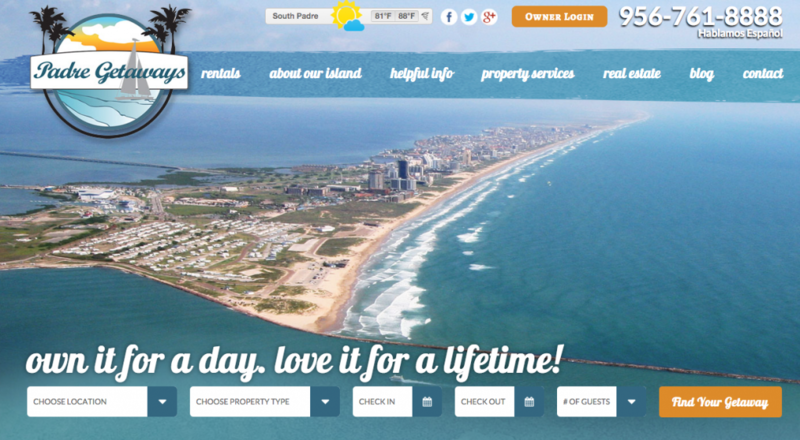 Padre Getaways, based in sunny South Padre Island, TX, recently launched a redesigned website with team ICND. Integrating with RMS, we were able to seamlessly integrate their property management software into our new booking engine platform. Padre has also opted for our LeadTracker software, a critical element to running their leads through a trusted software system that gets more bookings. Before, Padre Getaways offered limited ability to book online, but with their new integration in place, you now can effortlessly book Padre Getaway’s full inventory of vacation rentals. With our SEO team working with the team at Padre Getaways, we’re eager to see amazing results from their organic traffic and pay per click budgets too. We met up with Padre Getaways at VRMA Annual in San Diego late last year, and we were thrilled to meet their needs on the latest website design. With great new design elements like a new featured property widget on the homepage, an image-heavy design that emphasizes great photography and a conversion centric design, Padre Getaways is looking forward to finishing their summer strong. Would you like to learn more about our vacation rental website designs? Contact us today to get a free quote on our website designs that’ll get you looking just as good as Padre Getaways.